A Windows 7 build which possibly in the RTM branch has leaked. Windows 7 build 7106 is said to be a build which is meant for final RTM release. Microsoft is said to be developing two branch of Windows 7 simultaneously in parallel now, with one branch been prepared as Windows 7 RC, while another branch internally testing Windows 7 RTM. The leaked Windows 7 build 7106 is from Chinese forum. Thus, expectedly, only Chinese language version of Windows 7 Build 7106 is available in original untouched unmodified DVD ISO format. Since the release of official Windows 7 Beta build 7000, the unofficial leaks of newer builds have been made available almost every week. For example, build 7022, build 7048, build 7057, build 7068 and build 7077 that leaked just days ago. However, it’s expected official Windows 7 RC to be released soon. 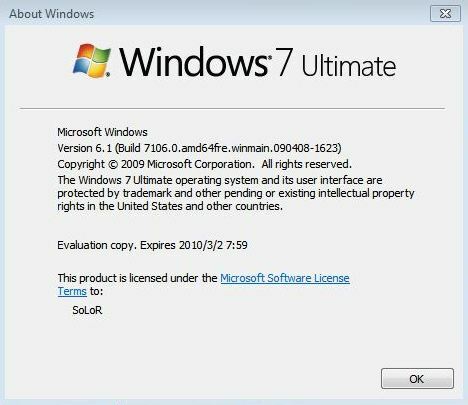 Windows 7 build 7106 has the build version of 6.1.7106.0.winmain.090408-1623, which translates to compilation date of April 8, 20009. After activating with free Windows 7 Beta product key, the evaluation expiry date for this build is June 2, 2010. Both 32-bit and 64-bit Windows 7 build 7106 is leaked to Internet, specifically via BT torrent network. Unfortunately, the English version of Windows 7 build 7106 hasn’t been leaked yet. 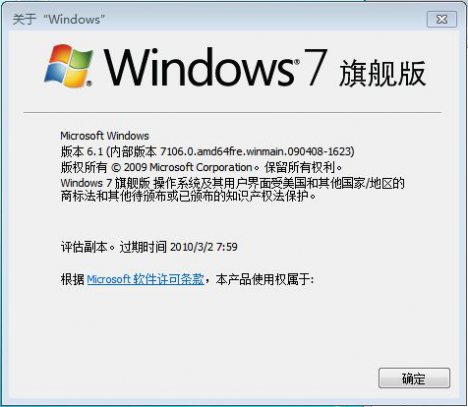 For Windows 7 enthusiasts who wants to install English language edition of Windows 7 Build 7106, can temporarily use the English language pack to transform and convert the Chinese version of Windows 7 Build 7106 to English UI. However, the conversion method can be complicated, with user requires to replace Windows 7 build 7106 installation files with files from downloaded English language pack. In order to convert Windows 7 Build 7106 Chinese to English, firstly, download the corresponding language pack (32bit or 64bit) from download links above, and then extract (or copy) ALL contents and folders in the language pack to C:\ root directory, replacing and overwriting everything. To avoid permission issues due to protected system files, it’s recommended to boot up from Windows 7 English DVD (build version is not important)), chose “Repair” option, then open a Command Prompt, and use “xcopy” command to copy the files. For example, the typical xcopy command syntax is “xcopy * C:\ /S”. The language pack comes with a batch script named 1stcopyme.cmd which located inside C:\English.7106.x86 folder. If the extracted files of language pack is located inside C:\English.7106.x86 folder, then the batch file can be used. Second step is to reboot into Windows 7. It will boot up with Chinese user interface. Run 2ndrunmeasadmin.cmd as Administrator (ignore if there is error), and then double click on English.reg to merge the required registry entries. Reboot and Windows 7 Build 7106 should now in English language. For user who loathe performing the not so easy conversion process, a Russian has managed to create an English language Windows 7 Build 7106 modified using the Chinese version with the English language packs. Only 32-bit is converted now, and thus don’t trust its file name, which is unofficial. And it appears that there are traces of Chinese language even after conversion.